Ayurvedic Treatment for Paralysis | ND Care Nirogam Pvt. Ltd.
ND Care Nirogam Pvt. Ltd. has pioneered a Concrete Ayurvedic Paralysis Treatment. We have AUTHENTIC & NATURAL supplements to support these conditions. Ayurveda can naturally speed up the recovery to the desired extent. The patients with paralysis can be successfully treated with Ayurveda. It has been widely accepted that an early Ayurvedic treatment of paralysis maximizes the recovery chances. The classical texts of Ayurveda widely enumerate the natural treatment guidelines for paralysis attacks. The line of paralysis treatment encompasses a combination of internal and external treatments (Panchakarma) viz. natural herbs and physical massages. Treatment of paralysis usually varies according to the types of paralysis and the patient's condition. The ancient Ayurvedic scholars have termed it as "Pakshaghata", which is caused by the exaggeration of Vata Dosha. This Vata Vyadhi (a disease caused by Vata Dosha) is corrected with scientifically documented herbs for paralysis and proven efficacious therapies to restore Prana Vayu to its normal flow. To this day, Ayurvedic line of treatment stands to be one of the most effective protocols to treat paralysis naturally. Additionally, the diet and lifestyle modifications are also essential throughout the Ayurvedic treatment of paralysis stroke. 1. Nidana Parivarjana: In this step, the avoidance of aetiological factors is highly recommended to manage the risk factors of paralysis and causes of paralysis such as hypertension, acute encephalitis, heart disease, trauma etc. Snehana (Oleation): Massage with Ayurvedic oils such as Maha narayana taila & Bala taila etc. Svedana (Hot fomentation): Shashtika shali pinda sveda & Sarvanga sveda etc. have also been proven to be very effective in the treatment of paralysis disorder. Virechana (Purgation): Cleansing with decoctions of Draksha (Vitis vinifera), Haritaki (Terminalia chebula.) etc. is very effective during the paralysis therapy. Vasti (Enema): We also understand that Vasti is very helpful in the treatment of the patients of paralysis. Nasya Karma (Through nasal): Nasya with Purana ghrita (Old Ghee) / Narayana taila / Ksheera bala taila through both nostrils can also help in the recovery of the paralysis patients. Shirovasti with Ayurvedic oils (Narayana taila / Ksheera bala taila) can speed up the patient's recovery. "Removes deep toxins in the neuromuscular system with Himalayan Shilajit"
Restores the integrity of the blood vessels. Abnormalities in tau protein are primary events that can lead to neurodegeneration in paralysis attack. 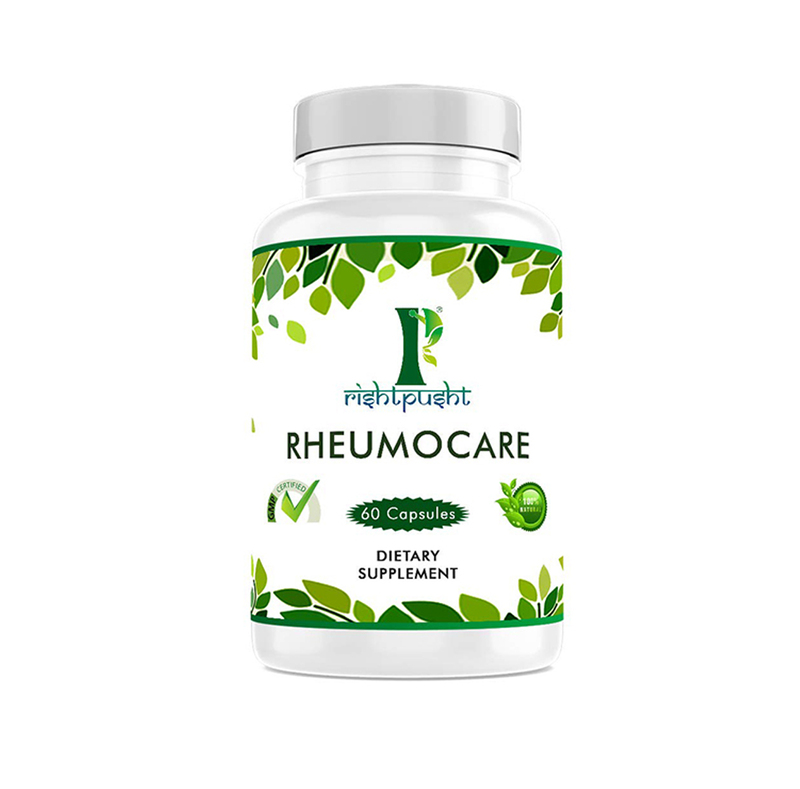 Rheumocare has Shilajit (humic substance: mineral pitch) as its main component. Shilajit has fulvic acid (approx 60% to 80%) which is responsible for its curative properties. The fulvic acid is known for its strong antioxidant actions and for the prevention of tau protein self-aggregation into pathological filaments. Hence, Rheumocare is an efficient choice for paralysis. Shallaki herb present in Rheumocare consist triterpenoids (boswellic acids). Triterpenoids preserve the structural integrity of joint cartilage and maintain a healthy immune mediator cascade at a cellular level. They naturally act against the pain and inflammation by inhibiting leukotriene synthesis. In Ayurveda, Shallaki is said to be Yogavaha (synergistic enhancer). The Organic components of Shallaki play important role in transporting different mineral substances to their cellular targets. Therefore Shallaki helps in treatment of neuromuscular treatment of paralysis. Paralysis is a temporary or permanent loss of neuromuscular function. Ayurveda can potentially heal the causes and injuries that lead to a paralytic attack. The main objective of our Ayurvedic treatment is to repair the damaged or semi-functional nerves with the help of Natural Herbs, Yoga, diet, and massage. For the aged patients, their bodies can be strengthened both internally and externally to speed up the recovery. The non-functional or partially damaged cells (due to swelling) of the brain can be set back to work. Bala (Sida cardifolia): It is well known to soothe the excited nerves by normalising Vata which helps the patient to recover quickly from paralysis. Ashwagandha (Withania somnifera): It acts as anti-stress agents, & rejuvenators which help in paralysis treatment. Vacha (Acorus calamus): It naturally treats problems related to Vata. It is a natural brain tonic and beneficial in treating neural disorders which are caused by paralysis. 1. Based on location: Monoplegia (it involves single limb i.e. one arm or leg), Paraplegia (both legs), Hemiplegia (one arm & leg of the same side), Diplegia (affecting symmetrical parts), and Quadriplegia/Tetraplegia (both arms & legs). 2. Based on severity: Partial and complete paralysis (minimal or un-controllable). 3. Duration: Paralysis may be temporary or permanent. 4. Affected muscles: Flaccid (muscles shrinkage) or spastic (hardening of muscles). 1. Mustard Oil: Mustard Oil is very effective in treating paralysis. Apply Mustard oil on the affected part of the body. 2. Garlic: Garlic is also another effective home remedy to treat paralysis. Take 5 to 6 slices of Garlic and grind them. Now add two spoons of honey in it. Now take this mixture daily. 3. Kalonji Oil (Nigella Sativa Oil): A massage with lukewarm Kalonji oil on the affected part of the body can also help. 4. Yoga:-Anulom Vilom Asana has shown very positive results in paralysis. Kapalbhati is also very effective.